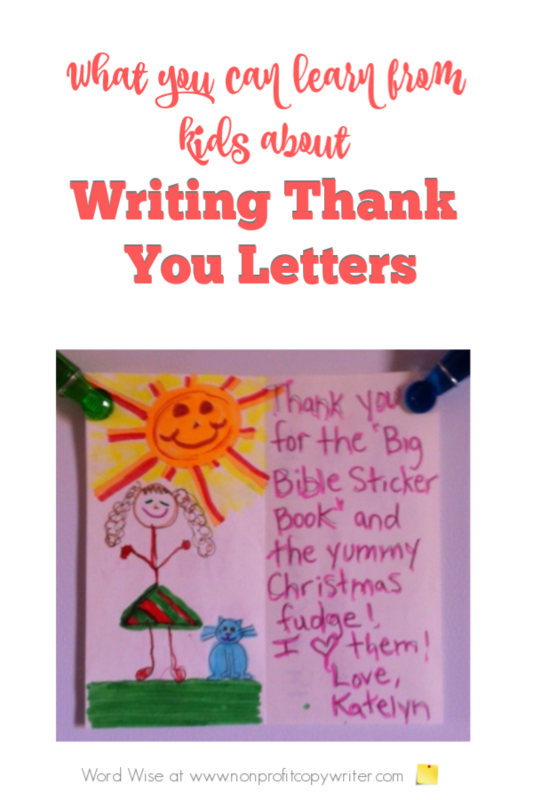 We can learn a lot about writing thank you letters from kids. Did I mention that she recently had a birthday? As I stood looking at Katelyn’s masterpiece (on the fridge door where I’d affixed it with magnets), I noticed a few things. It named the specific gift. Katelyn reminded us what we’d given her for her birthday. She didn’t used the “thanks for the present” line that’s much easier when churning out piles of letters. It told me what she thought about the gift. Katelyn gave her reaction. She loved the book and the fudge! It was hand signed. OK, the entire card was made by hand. But you get the point. It was made with thought. Now I admit, creating and coloring cards is a wonderful way to help a 5-year-old occupy some time and teach gratitude. Yet it is clear that the card was planned carefully (a drawing on the inner left panel and text on in the inner right panel, if you want to get technical about it.) And the images were perfect for the look and feel of the piece. Katelyn doesn’t know that she is already a development director’s dream. But she knows how to write thank you letters.